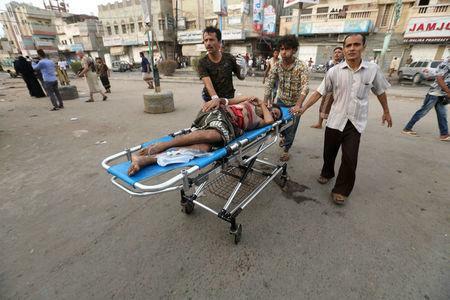 HODEIDAH, Yemen (Reuters) - The Saudi-led coalition spokesman accused Houthi militia of being behind an attack that killed and wounded dozens of civilians in Hodeidah in Yemen on Thursday, adding the coalition did not carry out any operations in the port city. Earlier on Thursday, medical sources and aid agencies said an air strikes by a coalition led by Saudi Arabia on a fishing port and fish market in Hodeidah killed 26 people and wounded 50 others. "The coalition follows a strict and transparent approach based on the rules of international law. We pursue any allegations and if there is any responsibility we will hold it transparently," Colonel Turki al-Malki told Al Arabiya television. "Coalition did not carry out any operations in Hodeidah today...Houthi militia are behind killing of civilians in Hodeidah on today," he added. Saudi Arabia, the United Arab Emirates and Sunni Muslim allies have been fighting in Yemen with Western backing for more than three years against the Iran-aligned Houthis. The Houthis control much of north Yemen including the capital Sanaa and drove its Saudi-backed government into exile in 2014. The strikes come as the United Nations tries to secure a ceasefire agreement between the warring sides. Yemen's Houthi group said on Tuesday it was unilaterally halting attacks in the Red Sea for two weeks to support peace efforts, a few days after Saudi Arabia suspended oil exports through a strategic Red Sea channel following Houthi attacks on crude tankers on July 25. Hodeidah port is the main conduit for supplies to Yemen, where around 8.4 million people are believed by aid workers to be on the verge of starvation. The Saudi-led alliance says capturing Hodeidah would cut off the main supply line of the Houthis and force the group to the negotiating table, but it has made no major gains since it launched the offensive on June 12. The Houthis have offered to hand over management of the port to the world body, according to the United Nations, but the coalition says the group must quit the western coast.